Tuesday's gone for real now which can only mean one thing... Hump Day and what happens on Hump Day? I take a look at a movie that involves two giant monsters fighting over a baby which can only mean that I'm reviewing the third Godzilla film from the "Heisei Series" titled "Godzilla Vs. Mechagodzilla" (not to be confused with the move of the same name that I reviewed on last year's Godzilla Week). Godzilla Vs. Mechagodzila (AKA "Godzilla Vs. Mechagodzilla II") starts off with a group of scientists (as do most Godzilla films) going on about Mechagodzilla and how they are going to improve it so they can destroy Godzilla. Sadly one of them gets transferred to the "G-Force" division. G-Force is a group made out of elite soldiers trained to battle Godzilla head on. The poor guy isn't doing too well as he is doing terrible at training plus not to mention he cops a lot of flack from his commander. The group travel to an island only to find that there are two giant eggs with one of them already hatched. They decide to take the egg back with them but oh no here comes Godzilla to ruin their time. Godzilla isn't alone as he is right away attacked by Rodan whom was in the already hatched egg. While they are battling the group take the unhatched egg back to the lab. Not too long after, the egg hatches to reveal that "Son of Godzilla" was in the egg and he has taken a liking to one of the female scientists as he thinks that's his mother. This isn't good as Godzilla is now off to Japan to look for him. Lucky for them Mechagodzilla is functional so they must deploy that groovy machine to stop Godzilla and protect both Son of Godzilla and Japan. (Click "Read More" to read the full review). The story in this film was alright and did have some interesting moments. Since they are going for something new in this one it does feel a bit rough around the edges but alas you will find some enjoyment from the story. I did find the format of the film pretty interesting too as it went: human scene, monster scene, human scene, monster scene, and so on until the closing credits roll. The main character in this one was very goofy to the point of nearly being a comic relief character and I liked him as he was very entertaining and you really feel bad for what he goes through. 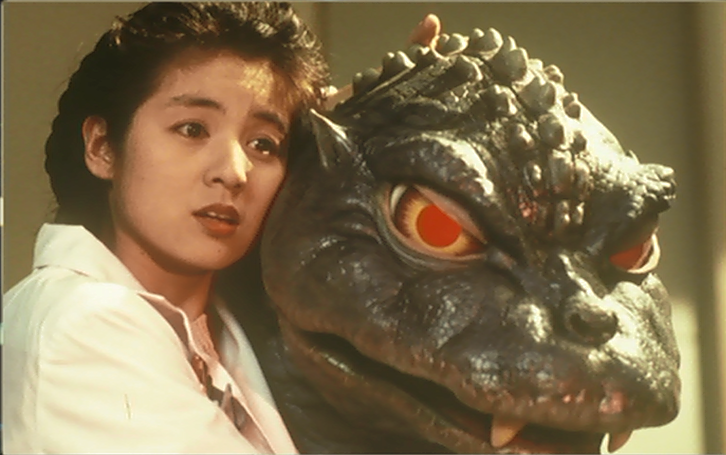 The female side-kick was also a very good character and played a very good mother figure to "Son of Godzilla" and you really feel for their relationship. The monsters in this film looked very awesome with some very menacing looking costumes that give a very "we mean business" vibe. While the monsters looked awesome their fight scenes were above average in this one. 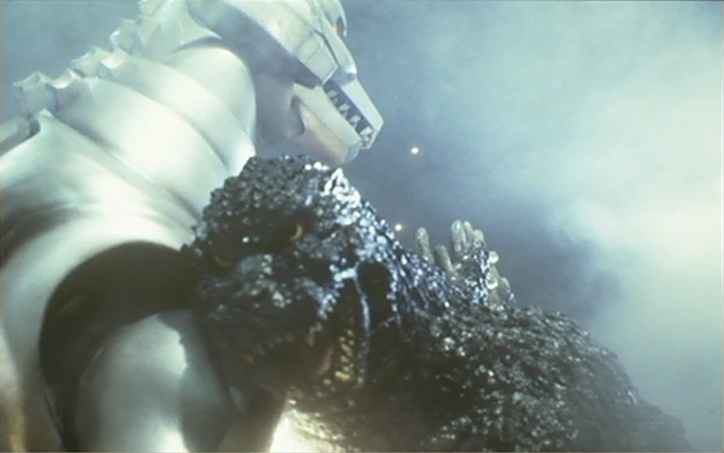 There are some good moments in the fights but they don't really do much with Godzilla and Mechagodzilla as they liked to focus on Son of Godzilla and Rodan to the point where this film should've been named something like "Son of Godzilla Vs. Rodan". The special effects are really awesome in this film with great uses of lighting and laser beams that look like that they are real and you won't tell that they are special effects. The scenery in this film has aged well with very fantastic uses of miniatures that works well with the monsters. I feel really warm on the inside when I see the destruction of the buildings in this one. They also like to make the giant monsters interact with the humans in this one and it was done very well. The English dub in this film was fairly decent but far from being perfect. The voices worked really well with the main characters but there are some minor characters that had some weird voices that did not work with those characters. You know when watching the English dub of Godzilla films to always expect the voices not to match up the lip movements and how charming it typically is but there was this one scene in this film where a group of school kids were singing. It looked very off in this film as all the kids were doing was just keeping their mouths wide open while the song was playing. This problem also occurs on the Japanese voice track as well and looks just as off. It might be a bit unfair being nit picky on children acting but screw it, it looked bad no matter which language track you watch this film on (I rambled on that for too long). Just like the previous reviews in this DVD box set you get: The theatrical trailer, teaser trailers, television ads, promotional photos, and movie posters. The trailers and TV ads are decent and do a good job at making this movie look interesting. The promotional photos look good but nothing really all that special. The movie posters for this film were mixed as one of them was pure clucking awesome with some really great artwork that makes this film look very chaotic but the other one that uses photos of the characters looks a tad bit cheesy and tacky. 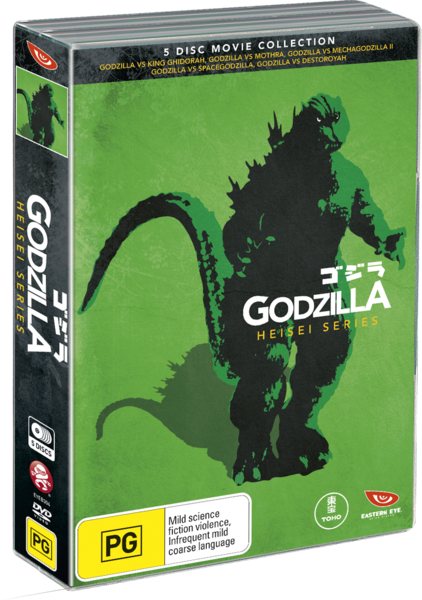 Overall this was an alright film and while it's not the best Godzilla film of all-time it was worth at least one watch. 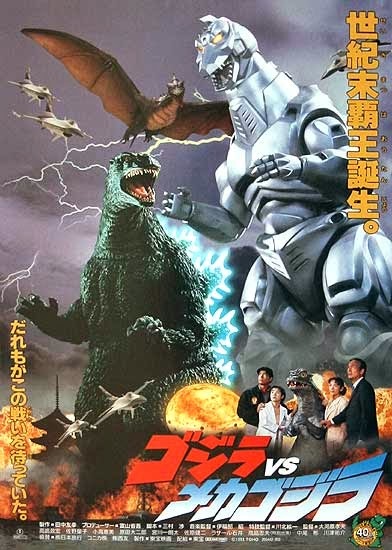 Well that wraps up the third day of "Godzilla Week 2014" and on tomorrow's edition I'll be looking at another "Zilla Vs. Zilla" film but this time it's "Godzilla Vs. Spacegodzilla" (way to make "Godzilla Vs. Mechagodzilla" sound like a sane title). 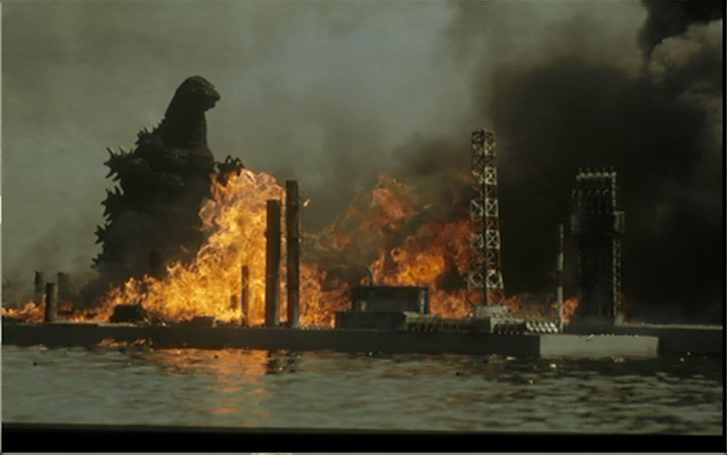 Catch y'all later for the next installment of "Godzilla Week 2014" (RRRRAAAAAAWWWWWWWRRRRRRRRRR).